What's Life Like For Your Teeth? Our Brisbane dental clinic is conveniently located right in the Brisbane CBD at 289 Queen Street. Our dentists are interested in the solutions that will provide you with the best long term health for your teeth. We also provide cheap Brisbane dentist options for those that are on a budget and can taylor treatment plans for you to suit your own needs. We are a general dental clinic in Brisbane cbd. Our dental clinic is not open Saturday or Sunday. We are not able to provide you with bulk billing. Bulk billing is not available for any dentist. We don't have a price list as each case is different. We are a preferred provider for many health funds. We can treat you for a dental emergency. We are not associated with the dental school. We are not associated with the dental hospital. We can accomodate you around your job for an appointment. $0/No Gap* dental checkup and clean. Free* Consultation for all cosmetic dental work. Our team of dentists fight gum disease, tooth decay and more, protecting the citizens of Brisbane city day and night. At Central Brisbane Dental, we are passionate about long term oral health and delivering that for our patients in a relaxed but still professional environment. Situated conveniently on the ground floor of the Manor Apartments, right next to the GPO and diagonally opposite Post Office Square, Central Brisbane Dental is named for its easy-to-find, centrally-positioned location in the Brisbane city. Central Train Station and Queen Street and King George Square Bus Stations are just minutes away, while secure parking and a taxi rank are available at MacArthur Central a few steps away. We aim to provide our patients with information about their dental well-being and a range of options on how to treat dental issues. As dentists, we are always looking to promote healthy teeth and gums for life, and we really do like to focus on helping you maintain good dental health for the long term. We do this by focussing on preventing dental problems by providing the right advice on oral hygiene, diet and habits that might be detrimental to your oral health such as clenching and grinding of your teeth, and snoring and sleep apnoea. We offer a wide variety of general dental services aimed at improving your dental well-being and overall quality of life, ranging from white fillings, crowns and wisdom teeth extractions to teeth whitening, dental implants and invisible braces. If you have a dental emergency, we understand that you may be in considerable discomfort and will fit you in on the day to relieve your pain and manage your problem. We also know that not every patient likes to see a dentist, and we know the reasons for this are diverse. It could be that you have a fear of feeling any discomfort during treatment, or you might find visits to the dentist can simply bring on anxiety. You might even just be worried about the cost of the work that may need to be done. As dentists, we know that the most expensive and painful dental situations come from procrastinating. When you come into our practice you’ll see straight away how much of a relaxed environment we have created, with pop culture references littered throughout our practice and projectors in each surgery to watch your favourite DVD during treatment. Our dentists are professional and well respected in our industry, but we are also real people. We can relate to you and provide you with a range of treatment options that work for you. Start looking after your dental health today by coming in for a general or cosmetic consultation. In most cases, there are no out-of-pocket costs for this initial consultation. You do not have to fear any kind of pain or discomfort as assessments are made by thorough visual inspection, not by the out-dated method of poking and scratching with a sharp instrument. 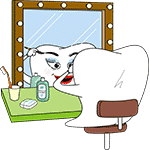 Let’s start by taking a look at everything, talking about it and going over options for promoting strong dental health, and why that is important and very manageable for you.